Who is Karim AbuZaid? If you look at Dawah Monthly as far back as March of 2014, we discover that he was the Imam of the Colorado Muslim Society. He is now with the Colorado Muslims* Community Center (Dar Al-Tawheed). The Colorado Muslim Society currently claims to be the largest Muslim community in all of Colorado. Since this is missing from his current bio, requests were sent for verification of this claim by the Dawah Monthly. Karim AbuZaid claims in his bio to have obtained a PhD in Cairo, Egypt through American Open University on his bio. This is problematic since AOU is an online school based in Alexandria, Virginia. For this reasons requests were sent to AOU to verify his claim of having a PhD from their University. 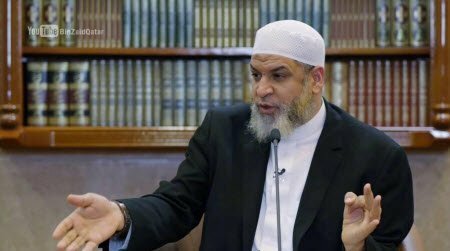 Karim AbuZaid also claims to be the founder of the “Tafseer Al-Qur’an Institute,” which operates in multiple states, however it is not a registered business entity with Colorado, nor is registered as a non- profit according to Guide-Star.org. “Unfortunately, this [Muslim control over Jerusalem] lasted for a little bit, then it’s taken away from us through a promise that was given to the Jewish people by [Britain’s] prime minister called [Arthur] Balfour… [Arthur] Balfour is a human being who gave a promise [a public statement issued by the British government during World War I announcing support for the establishment of a ‘national home for the Jewish people’]. [Donald] Trump is a human being who made a promise [recognizing Jerusalem as the capital of Israel]. We have a promise from Allah. We have a promise from Allah that this land [Palestine] will come back to the [Muslim] believers to the Muslims, to salves (ibad) of Allah, to the slaves of Allah. It is certain. I swear by Allah, [wallahi] it is certain and they believe in it. I swear by Allah, [wallahi], they know it is going to happen. I swear by Allah, [wallahi], I have no doubt it is going to happen. And if you doubt this then you have to go back and check your belief in the oneness of Allah [tawheed], your belief system, your faith [aqidah]. You have to check that. Allah, Glorified and Exalted be He [subhanahu wa taala], you know like Joshua called upon the sun. He said to the sun: Stay still. You know that we believe that the rock, the rock will call upon the believer, but look how it will call him: Ya Abdallah, Oh slave of Allah, come! Behind me is an enemy of Allah. The rock will help you to do this.” (AbuZaid, Karim. YouTube. May 29, 2018. Accessed February 08, 2019. “[originally in English] At this time, my brothers, the battle will start, look at this, the rock will talk to the believer… the rock will talk to the [Muslim] believer: Come behind me there is a disbeliever. The rock. Earth. Earth will support the believers… [originally in Arabic] [O Allah], establish our feet firmly and give us victory over (support to overcome) the disbelieving people… O Allah, grant victory To Islam and honour the Muslims, and humiliate the polytheism and polytheists and defeat the enemies of the religion [of Islam] O Lord of the worlds. O Allah, make this Ummah [Muslim nation] follow the rightly guided way, in which the obedient people [beliver] are honoured and the hypocrites and the infidels [disbelievers] will be humiliated and the sinners will be exterminated…” (AbuZaid, Karim. YouTube. July 22, 2017. Accessed February 08, 2019. 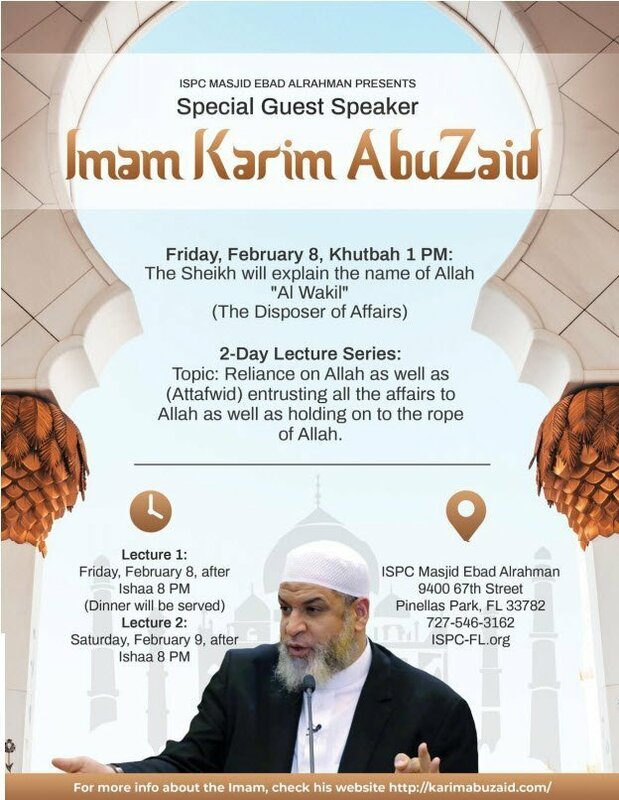 Now it cannot be ignored that the Islamic Center of Pinellas County, Florida has had Imam AbuZaid as a guest speaker since at least 2015. This says something about the Mosque’s belief structure and a very possible and likely encouraged belief in Anti-Semitism. Is this something that Pinellas County citizens are aware of? Is law enforcement aware that Anti-Semitism is likely encouraged at the mosque? These are important questions! 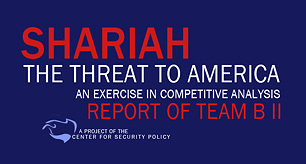 *Not a misspelling taken straight from the Imam’s site. Hat tip to The United West for sharing Karim AbuZaid is speaking in Florida on February 8 and 9, 2019.